articles in this series have discussed many of the key California issues and opportunities. We have also looked specifically at asset protection for California real estate. In this article we will focus on what you should know about the impact of community property law on asset protection. The general rule in California is similar to that in most states. All property of the debtor is subject to a money judgment unless it is specifically exempt. But California then goes much further in defining what the phrase “property of the debtor” means. As a community property state, California includes as “property of the debtor” all community property owned by a spouse. Community property is loosely defined as all property acquired during marriage, regardless of how the property is titled. The impact is that all savings, property and other assets in the name of one spouse will generally be subject to collection for the debts of the other spouse. That is, property held by the debtor plus property held by the debtor’s spouse can be collected in a judgment. This rule generally applies even if the obligation arose prior to the marriage. This differs from the law in common law states where assets can be owned jointly or by one spouse or the other. Separate property of a spouse is generally not liable for debts of the other spouse. There are some exceptions to this rule for obligations created by a spouse which benefit both spouses but normally separate property is protected from the other’s creditors. 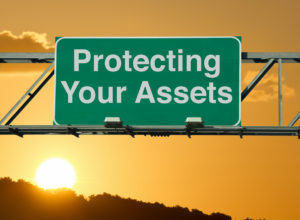 One approach to asset protection planning may be to reinforce the separate identity of one spouse’s property. Although California law creates a legal presumption that all assets acquired during marriage are community in character, the parties themselves can agree to hold properties as separate property. Properly documenting this intent through pre or post marital agreements or transmutation agreements is important evidence of this intent. Maintaining property in separate accounts and in separate legal entities or asset protection trusts is also valuable evidence. Many of our clients are concerned that money or other property intended for a child will be subject to claims from the child’s current or future spouse. These claims may arise from the creditors of the child’s spouse or directly from the spouse in the event of a divorce. In California, property acquired before marriage or during marriage from an inheritance or gift is the separate property of the spouse. That provides legal protection from creditor claims and divorce. The biggest issue that we see in these cases is that separate property loses it’s protected identity if it is comingled with community funds or separate property of the other spouse. Separate property which is commingled, will be characterized under the community property presumption. Commingling occurs when property intended to be held separately is not clearly distinguished by the parties. An example of this, common in California, is parents gifting money to a married child for a down payment. If all contributions by the spouses for the down payment and mortgage and upkeep are equal then maintaining a separate property classification is possible if the source of the funds are clearly identified. When contributions are not equal, questions are likely to arise as to the division of capital and profits. How should these items be allocated to reflect the unequal contributions of the spouses? What belongs to the community and what is separate becomes problematic may be vulnerable in litigation with a third party. The same is true of any other investments made by the couple. Parents intending to protect an inheritance or gift for a child’s benefit and to protect against creditor claims and divorce, should address and resolve these and other comingling issues in the asset protection planning associated with the transfer . If not, legal fees arising in a future dispute will likely render the issue moot. What portion of capital and profits should be considered protected separate property and what portion is community property? How are the mortgage payments and maintenance expenses to be allocated? If contributions to the down payment or mortgage payments or maintenance expenses on the family residence are unequal or on investments. California law treats property acquired after marriage as community property, owned equally by both spouses. As such, all of the community property is liable for satisfying an obligation incurred by one of the spouses. Property which is intended to be held as separate property of a spouse is not subject to these claims. This matter is of particular concern when one spouse is subject to greater liability risk than the other. Separate property of a spouse is also not subject to division in the event of a divorce. Community property rules in California also impact parents of one spouse who wish to gift or transfer property to a child. Although property acquired by gift or inheritance is the separate property of the child, that characterization will be lost if it is comingled or not sufficiently identified as separate. Written agreements before or after marriage, including transmutation agreements, provide evidence of intent. Separate Property Trusts and other asset protection trusts are also effective in formalizing property ownership and protecting assets of a spouse from potential claims.